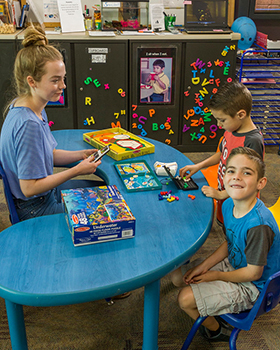 Each semester, returning parents get priority to sign up for childcare up to two weeks after class registration begins. New parents can register beginning Monday after the two weeks have passed. We accept applications on an on-going basis. Please contact the Nontrad Center at 801-626-7794 to check for open spaces and exact dates. 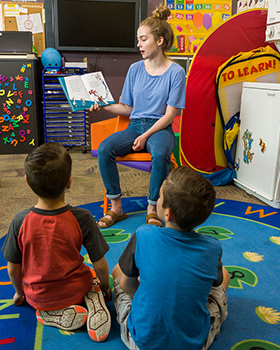 The Hourly Child Care Center is a state-licensed facility that provides hourly care to WSU students' children while they attend classes or partake in academic events. Students must apply and have set schedules for attendance. Backup care is offered for students and faculty/staff when their primary care provider is unavailable (if the center has space that day). Call the center to see if they are available when needed. 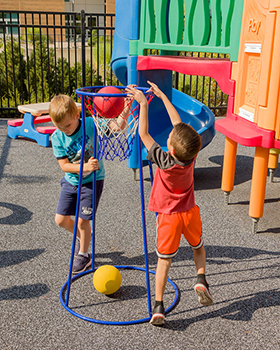 Extended hours (5 p.m. – 9 p.m.) can be requested by filling out the Hourly Childcare Center Extended Hours Request form. Note: Completing this form does not guarantee space. 7 a.m. - 3 p.m. with extended hours by request. Your child's safety is our number one priority. Space is limited and the application does not guarantee a seat. One packet must be submitted for each child. Existing parents have to re-apply every semester. Complete the Hourly Child Care Center Returning Parent Application Packet. The application packet includes the emergency card and parent contract. Submit a copy of your class schedule along with this packet. Extended hours (5 p.m. – 9 p.m.) can be requested by filling out the Hourly Childcare Center Extended Hours Request form. Update your information in the ProCare system. Pay the $42 deposit prior to the first day of care. The deposit is applied to the first 12 hours. Schedule an orientation with the Hourly Child Care Supervisor every semester to review the policy and procedures. Call 801-626-7794 to schedule your appointment. Complete the Hourly Child Care Center New Parent Application Packet. The application packet includes the emergency card, background information form, admissions agreement, health assessment, and immunization records. Pay a one-time non-refundable application fee of $15. Turn in application, receipt for $15 fee (per family), and attach a copy of your current class schedule to the Hourly Childcare Supervisor. You will be notified of your acceptance via email. Once accepted, you will be asked to add your information to the ProCare system. Pay the $42 deposit (per child) prior to the first day of care. The deposit is applied to the first 12 hours. Schedule an orientation with the Hourly Child Care Supervisor. Call 801-626-7794 to schedule your appointment.